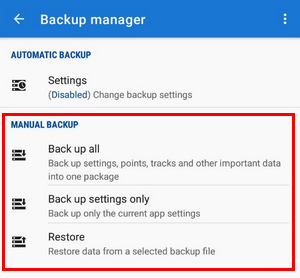 The Backup Manager enables one-time backup of Locus settings, points and tracks or defines periodic automatic backups. Backups can be also shared to your favorite cloud services and used for transferring the application data from one device to another. Backup all - enables immediate one-time backup of all settings, points and tracks into one package. The time stamp is default as the package name but it is possible to change it. By default, the package is stored into Locus/Backup directory (it can be changed in settings > miscellaneous > default directories). 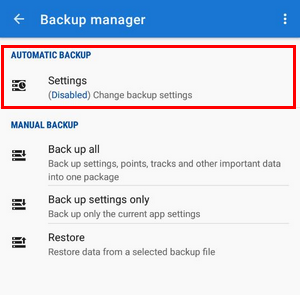 Backup settings only - creates the settings backup package. Useful if you use various sets of app properties. Restore - shows content of /Locus/backup/ directory from which you can select a backup file to restore. In case of file with all backup you are prompted to select what content of the package you want to restore. … saves settings, points and tracks periodically to Locus/backup/auto directory without user's interference. 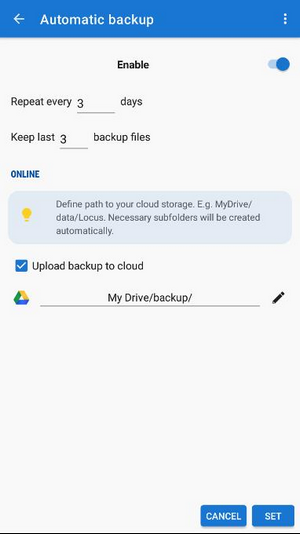 You can also set automatic backup to Dropbox or Google Drive. Automatically saves Locus settings, points and tracks to your selected directory at Dropbox or Google Drive. Make sure you have applications of the services installed on your device.